Today I learned how to be a better person. Apparently, I'm not as nice as I should be. Normally, my response to this criticism (constructive or not) is "too bad, so sad". I don't feel the need to be what someone else thinks I should be, especially if it involves me being sweet or nice or any variance thereof. However, this request came from my mother about my attitude towards her significant other. Okay, I'm going to try. Actually I've been making baby steps towards being nice to her SO but it's not enough for people to actually take notice and congratulate me. So I have to put on fake happiness and sweetness around those two and hope that they don't see it as sarcasm. My dreams have been crazy wild lately. They are so vivid to me, and they seem to be my just-before-waking dreams. I wake up so in the moment. Most of my dreams involve me being chased or followed, not always in a sinister way. Sometimes the dreams are very dark and scary (life-threatening), while others seem more fantasy or anime-like. I was at the pool today (for only a few hours) and I'm so red. I'm too old to be damaging my skin like this. I made a mistake and I will not go to the pool again without covering my skin. I'm feeling no pain right now. While I've been out of work for a whole week, I'm not feeling pressured to return to the land of the working man. I have been looking for other jobs in the area because I miss the interaction and the daily challenges any job can bring. My desire is to do something creative with my life; I love shopping at the craft stores and just browsing the aisles, touching the yarns, imagining if I had unlimited funds to buy and create all day. That dream makes me so happy. That's a first for me. So I have enough money to last me through a few months; thus the reason for my seemingly-carefree life. I do need to find a job. I'm not crazy; just living for the moment for once. Living to be happy. Relaxing. all of the stitches, all rows, back to what I am guessing they call yarn puke. My pattern is so easy that I'm back to about 2" of new knitting. I'm really unsure of how to do the neck opening and how I am going to sew the seams together. I am not very good at sewing. I suspect I'll be on the Knitting Help site and asking a lot of questions. 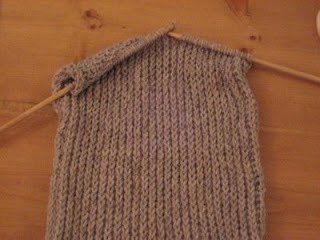 I started my sweater. It's not exactly the yarn I wanted but this wool/acrylic blend was only $1 per skein at Michael's. The lady at Michael's told me that just looking at my wool was making her hot. July in Florida; I guess that's the reason this stuff was so cheap. This is my last week at work. My nerves are setting in but I'm trying to overcome my fears. I'm determined to make this a good decision. And I keep telling myself that everything is going to be okay.